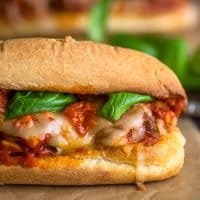 This is The Perfect Meatball Sandwich, made on toasted, buttery garlic bread, with an easy homemade marinara sauce and my favorite beef and sausage meatballs. With an immersion blender, food processor, or blender, process tomatoes until mostly pureed--the texture of chunky salsa. You can also turn the tomatoes out into a bowl and crush them with your hands (don't discard the juices). In a large skillet, heat oil over medium heat. Once hot, add the garlic and cook just it starts to turn lightly golden--watch carefully so it doesn't burn! Add the tomatoes and juices to the skillet along with water, salt, sugar, oregano, red pepper flakes, and sprig of basil. Cover with splatter screen and bring to a good simmer, turning up the heat if necessary. Simmer, stirring occasionally, for 15 to 20 minutes until sauce is thickened. Taste and add more salt if needed. Preheat your oven to 400°F. Butter both sides of your bread and sprinkle garlic powder over the top. Place on a baking sheet and bake for 3 to 4 minutes until lightly toasted. Add a couple tablespoons of sauce to both sides of each French roll and top with 3 to 4 meatballs and 1/4 cup of mozzarella. Bake for an additional 2 to 3 minutes, until cheese is melted. Add fresh basil if desired. Serve and enjoy! This makes enough sauce for 4 to 5 sandwiches. Leftover sauce can be stored in the refrigerator for up to 5 days or frozen for 2 to 3 months in an airtight container or freezer bag.